Federal Reserve Chairman Ben Bernanke continued to warn lawmakers of the dangers of going over the fiscal cliff. "If the fiscal cliff was allowed to occur and certainly if it were sustained for any period, it could have a very negative affect on hiring, jobs, wages, economic activity, investment and of course, the consequences of that would be felt by everybody," Bernanke said at a press conference Wednesday. Bernanke popularized the term "fiscal cliff" earlier this year, referring to a combination of spending cuts and tax increases set to go into effect at the beginning of 2013. Some economists have since said the cliff may actually look more like a fiscal slope, as households and businesses will see the impact of tax increases only gradually. Meanwhile, lawmakers may come to a deal on some issues, without solving them all. But Bernanke said Wednesday that regardless, he believes even a partial cliff is dangerous. "I don't buy the idea that a short-term descent off the fiscal cliff would not be costly," he said. " I think it would be costly and in fact, we're already seeing costs." He pointed to a recent drop in consumer and business confidence, a volatile stock market and weak business investment as signs that the fiscal cliff is already having an impact. "I'm hoping that the Congress will do the right thing on the fiscal cliff. There's a problem with kicking the can down the road," he said. Stocks were higher earlier in the day after the Fed announced it would expand its stimulus program in an effort to improve the job market. But the market pulled back during and after Bernanke's press conference to finish the day mixed. Fed: More easing until unemployment below 6.5%. The Fed also tweaked its forecasts for the U.S. economy, predicting slightly slower growth ahead and barely any change in the unemployment rate next year from current levels. The central bank predicts the U.S. economy will grow 2.3% to 3% next year, down from its September forecast of at least 2.5% growth. Meanwhile, the Fed expects the unemployment rate will fall to between 7.4% and 7.7% by the end of next year, marking little improvement from where it stands now. As of November, the unemployment rate was 7.7%. The Fed had said in September it though the unemployment rate would be between 7.6% and 7.9% in 2013. For the first time ever, the central bank outlined parameters that would guide its monetary policy decisions. The Fed said it plans to keep interest rates near zero until the unemployment rate falls below 6.5% or inflation accelerates faster than 2.5% a year. From the Fed's own forecasts, it's clear the central bank doesn't predict either of those things will happen until at least 2015. The forecasts come from all 19 members of the Federal Open Market Committee, which met for two days this week. Of those members, 12 have votes that determine the Fed's policies. 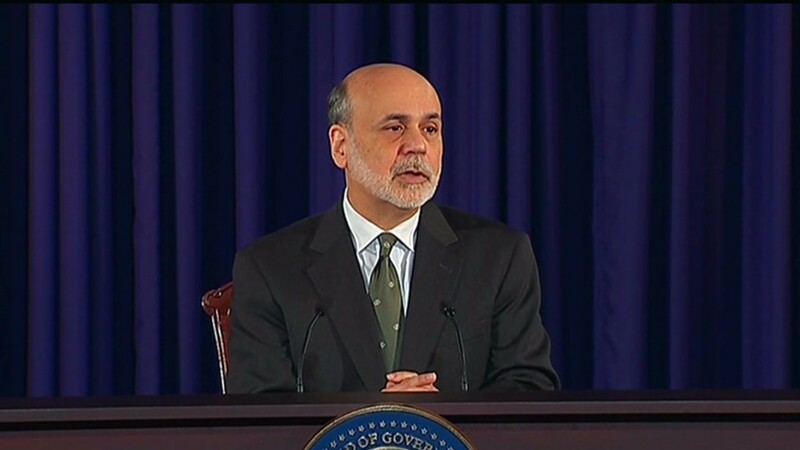 Have a question for Federal Reserve Chairman Ben Bernanke? Tweet it to @annalynkurtz on Twitter.